Adenosine kinase (ADK) is the chief adenosine removing enzyme in the brain. Experimental research has highlighted that ADK is a diagnostic and a therapeutic marker for epilepsy. Clinical research from patients with pharmacoresistant epilepsy also indicated that maladaptive changes of ADK lead to recurrent seizures in human chronic epilepsy, including Rasmussen encephalitis, focal cortical dysplasia, mesial temporal lobe epilepsy and Sturge-Weber syndrome. In addition, a subpopulation of remaining neurons demonstrated a revertant fetal expression pattern within the lesions are increasing, indicating that the early stage of developmental microenvironment alteration may impair the temporal transient expression pattern of neuronal ADK from fetal to postnatal brains. Increasing levels of ADK expression and adenosine deficiency caused by high levels of ADK played a crucial role in pharmacoresistant epilepsy and epilepsy associated comorbidities. Dysfunction of adenosine system may be a common pathologic hallmark of human pharmacoresistant epilepsy, which suggested the specific targets in the treatment of epilepsy, comorbidities associated with epilepsy in the patients. Future studies will undoubtedly seek to find the novel therapies targeting on ADK and to uncover the mechanism responsible for these future epilepsy therapies. Epilepsy is a common condition effecting people of all ages, gender, and socioeconomic status. It is the third most common neurological cause of years lived with disability in the world . Epilepsy is a prototype neuropsychiatric illness between the interface of neurology and psychiatry. Therefore, treatment of comorbidity associated with epilepsy could contribute to the therapeutic effect of epilepsy and improve the quality of life. More than one third of patients with epilepsy are pharmacoresistant [2-4], and apart from those who are candidates for resective surgery, most patients will continue to suffer recurrent seizures and comorbidities comprising of neurologic, cognitive and psychiatric symptoms [5-8]. Therefore, novel solid biomarkers for the prediction, diagnosis, and treatment of epilepsy and comorbidities associated with epilepsy are crucial to improve the quality of life in patients with epilepsy . Adenosine, as an endogenous neuromodulator, plays a crucial role in inhibition of seizures [9-12]. ADK is the chief enzyme in adenosine metabolism under baseline conditions and crucial to maintain adenosine homeostasis. ADK activity keeps adenosine levels low. Slight changes in enzyme activity result in major changes of adenosine concentration. Adenosine is an inhibitory neuromodulator released during epileptic seizures, and demonstrated an important role to stop seizures, postictal refractoriness, and inhibition of the development of epileptogenesis . Dysfunction of adenosine system has been demonstrated as one of the mechanisms underlying for comorbidities associated with epilepsy. In addition, focal augmentation of adenosine in the brain not only inhibits recurrent seizures but also improve comorbid symptoms associated with epilepsy . Overexpression of ADK has recently proved to lead to cognitive and psychiatric symptoms associated with epilepsy [13,14]. Adenosine kinase has been extensively studied in experimental epilepsy models [9-11,15,16] and in patients with pharmacoresisitant epilepsy such as mesial temporal lobe epilepsy (MTLE) [11,17], tumor related epilepsy , Rasmussen encephalitis (RE) [19,20], focal cortical dysplasia (FCD)  and Sturge-Weber syndrome (SWS) . Overexpression of ADK plays a significant role in the epileptic seizures and epilepsy development . Therefore, ADK is regarded as a specific diagnostic and treatment target for epilepsy by activation of multiple adenosine receptors-dependent pathways [9,15,24]. Developmental studies performed in mice indicate that there is a switch from neuronal expression during the perinatal period to almost total astrocytic expression in the adult brain . Interestingly, strong neuronal expression of ADK has been detected in human fetal brains (gestational week 13; temporal cortex) . Dynamic changes in ADK gene transcription during early postnatal brain development was also documented, and binding of transcription factor specificity protein 1 to the ADK promoter influences the regulation of ADK expression . The overlap of maladaptive changes in adenosine homeostasis suggests common pathogenic mechanisms for epilepsy and comorbidities associated with epilepsy. Overexpression of ADK and adenosine deficiency is a common pathological hallmark in patients with pharmacoresistant epilepsy caused by a wide range of neurodegenerative conditions . Therefore, therapeutic adenosine augmentation might have the potential to treat recurrent epileptic seizures and comorbidities associated with epilepsy in these neurodegenerative diseases such as MTLE, RE, FCD and SWS. RE is a rare progressive inflammatory disorder of uncertain etiology that characteristically occurs in children who present with refractory seizures, cognitive deterioration, and progressive hemiparesis, resulting from dysfunction of one cerebral hemisphere. RE is associated with hemispheric atrophy, focal epilepsy (epilepsia partialis continua, EPC), cognitive deterioration, and progressive neurologic deficits that result from progressive loss of function subserved by the involved cerebral hemisphere [19,20,28-32]. Radiologically, characteristic magnetic resonance imaging features are areas of cortical hyperintense T2/fluid-attenuated inversion recovery signal and progressive atrophy in the affected cerebral hemisphere with mild or severe enlargement ventricle  (Figures 1A-1C). The pathologic features of RE are well described as lymphocytic infiltrates (perivascular lymphocytic cuffing), microglial nodules, neuronal destruction, and gliosis of the affected hemisphere [19,34,35]. 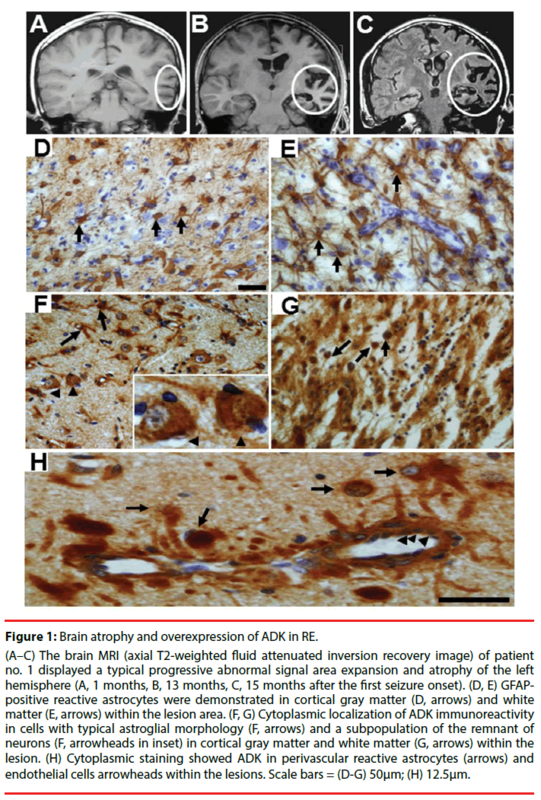 Figure 1: Brain atrophy and overexpression of ADK in RE. (A–C) The brain MRI (axial T2-weighted fluid attenuated inversion recovery image) of patient no. 1 displayed a typical progressive abnormal signal area expansion and atrophy of the left hemisphere (A, 1 months, B, 13 months, C, 15 months after the first seizure onset). (D, E) GFAPpositive reactive astrocytes were demonstrated in cortical gray matter (D, arrows) and white matter (E, arrows) within the lesion area. (F, G) Cytoplasmic localization of ADK immunoreactivity in cells with typical astroglial morphology (F, arrows) and a subpopulation of the remnant of neurons (F, arrowheads in inset) in cortical gray matter and white matter (G, arrows) within the lesion. (H) Cytoplasmic staining showed ADK in perivascular reactive astrocytes (arrows) and endothelial cells arrowheads within the lesions. Scale bars = (D-G) 50μm; (H) 12.5μm. Over expression of ADK has been indicated to play a crucial role in the recurrent seizures and the development of RE [19,20]. In control (autopsy or surgical control cortex) white matter, immunostaining indicated that weak ADK expression only in sparse glial cells with and lack of ADK immunoreactivity in neuronal cells [19-21]. In addition, our recent work showed that there is no obvious difference in ADK expression between children (more than 3 years) and adult autopsy control cortex. Therefore, further study is needed on younger children for the developmental and age-related differences . In RE specimens, there were reactive astrocytes in cortical gray matter (Figure 1D) and white matter (Figure 1E) within the lesion area, which are characterized by a hypertrophic morphology with larger soma and increased length and width of astrocytic stellar. ADK expressed in reactive astrocytes (Figure 1F and Figure 1G). The expression of ADK was prominent in perivascular areas (Figure 1H). In addition, endothelial cells displayed marked ADK immunoreactivity (Figure 1H) within the damaged hemosphere. For the reason that the majority of the neuronal cells are mature cells with no ADK expression, these cells are regarded as the chief source for the direct release of adenosine . In RE, ADK was found not only expressed in reactive astrocytes, but also in a subpopulation of the remaining neuronal cells in cortical gray matter within the lesion area, with a predominant cytoplasmic localization (Figure 1F). Notably in a subset of lesional neurons representing 38.5%, 47.1%, and 56.7% of residual neurons in the mild, moderate, and severe RE, that may be part of the pathophysiology of RE or represent a revertant fetal expression pattern . The neuronal expression of ADK in the lesion of RE cortex maybe inflammation associated, indicating a potential additional layer of modulatory cross talk between the astrocyte-based adenosine cycle and inflammation . Another hypothesis on neuronal expression of ADK in RE is that the early stage of developmental microenvironment alteration might destroy the transition of neuronal ADK from fetal to postnatal brains [25,26]. Potential gene regulatory mechanisms including DNA promoter methylation, histone modifications and transcription factor binding may influence the dynamic regulation of the ADK gene during early postnatal brain development and maturation. Recent study indicated that binding of transcription factor specificity protein 1 to the ADK promoter influences the regulation of ADK expression . FCD is developmental malformation of the cerebral cortex that is highly associated with pharmacoresistant epilepsy in children and young adults [37,38]. One of the commonest forms of FCD in children is FCD type IIB (FCDIIB) , which is characterized by cytomegalic dysmorphic neurons (Figure 2E) and a unique population of abnormal cells known as balloon cells (BCs) (Figure 2E) [40-42]. Balloon cells are identified as abnormal elements characterized by huge size, ill-defined membrane, pale cytoplasm and one or more eccentric nuclei. These cells are heterogeneous populations that express cell surface markers for pluripotential stem cells and proteins for multipotent progenitors, or immature neurons/glia. It is regarded that dysfunction of proliferation caused by early embryonic insult plays an important role in the formation of balloon cells [21,43]. Balloon cells in patients with FCDIIB are thought to originate from glioneuronal progenitor cells, strongly suggesting that defects of neuronal and glial specifications are important in the histogenesis of FCDIIB . Neuroimaging hallmarks include hyperintense T2-signaling (Figure 2A-2C) and a ‘‘transmantle sign’’. Clinical electrophysiological recordings demonstrate relative specific interictal spike patterns . Figure 2: Imaging, pathologic features and overexpression of ADK of FCD IIB. (A-C) Hyperintensity in coronal (A), sagittal (B) and axial (C) MR FLAIR image reveals the center of an FCDIIB lesion (arrows) in the right frontal lobe. (D) Hypertrophic morphology of reactive astrocytes was shown in the cortex of the lesion (arrows). (E) Enlarged dysmorphic neurons with enlarged nuclei and abnormal intracytoplasmic Nissl aggregates (arrowheads) and balloon cells (arrows) are pathologic hallmarks of FCDIIB. (F) GFAP positive BCs (arrowheads) and reactive astrocytes surround BCs (arrows); (E) Cytoplasmic localization of ADK immunoreactivity in cells with typical astroglial morphology (arrows), balloon cells (white arrows) and enlarged dysmorphic neurons (arrowheads). Scale bars = (E-G) 50μm; (H) 12.5μm. 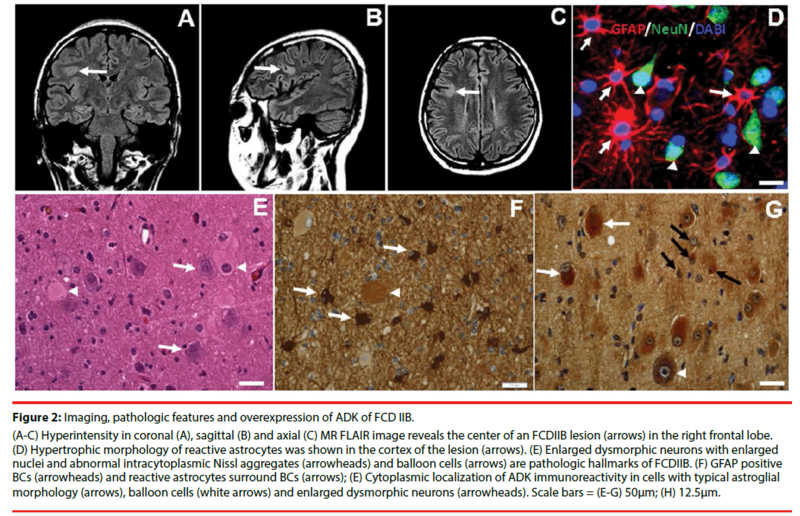 Overexpression of the ADK concomitant with astrogliosis within the lesions of FCDIIB has been demonstrated in the recent study . Reactive astrocytes, characterized by a hypertrophic morphology with larger soma and increased length and width of astrocytic stellar, were found in in the lesion area (Figure 2F). Marked GFAP-positive reactive astrogliosis was often observed around BCs (Figure 2F) in the lesions of FCDIIB. 45% BCs were observed to be GFAP positive (Figure 2F). Cytoplasmic expression of ADK was found in reactive astrocytes (Figure 2G), and a total of 77% of BCs were ADK positive (Figure 2G), and BCs expressing the different cell markers expressing different degrees of ADK in FCDIIB specimens. High levels of ADK expression in BCs and reactive astrocytes within the lesion of FCDIIB is thought to downregulate the adenosine level, which might result in lowering the threshold of seizures and leading to recurrent seizures. On the other hand, ADK may play a key role to influence the proliferation function of neural progenitor cells . Radial glial cells in the ventricular zone are the source of BCs in patients with FCDIIB, which retain an embryonic phenotype . The expression of ADK in the BCs may suggest that these cells fail to mature fully and therefore continue to express embryonic genes and proteins. These immature cells may lack some of the cellular machinery for migration. This may explain at least in part the localization of the BCs in the white matter and the gray/white matter junction (deep cortical layers), which are similar to the ADK expression pattern at early stages of corticogenesis . Accordingly, the presence of BCs may indicate that the early stage of insults during the prenatal/in utero period leads to the dysfunction of the neural stem cells in the ventricular zone area, impair the normal function such as proliferation, maturation, migration, and terminal differentiation of neural stem cells . At last, potential gene regulatory mechanisms may also influence the dynamic regulation of the ADK gene during early postnatal brain development and maturation . Of note, activation of the mammalian target of rapamycin (mTOR) signaling pathways is regarded to be associated with focal malformations of cortical development [46-48]. Recent study indicated that the nuclear isoform of ADK might be associated with regulation of cell proliferation through a combination of epigenetic and additional adenosine receptor independent mechanisms, such as interaction with the mTOR pathway. MTLE is regarded as the most common form of epilepsy in adults , and the hallmark neuropathological features in patients with intractable MTLE is hippocampal sclerosis (HS). Neuroimaging hallmarks include signal hyperintensity in T2 images and volume reduction in the hippocampus (Figure 3A and Figure 3B) . Hippocampal specimens of pharmacoresistant MTLE patients that underwent epilepsy surgery for seizure control reveal the characteristic pattern of segmental neuronal cell loss and concomitant astrogliosis (Figure 3C and Figure 3D). The marked pathologic characteristic of HS is astrogliosis. According to the histological patterns of subfield neuronal loss and astrogliosis, HS is divided into 3 subtypes . Concomitant with astrogliosis within the hippocampus in MTLE, overexpression of the astroglial ADK and residual neurons in HS has recently been reported in pharmacoresistant MTLE [11,17]. ADK immunoreactivity in both HS and temporal cortex of MTLE patients was observed in cells with typical astroglial morphology (Figure 3E and Figure 3F). (A, B) Coronal (A, arrows) and axial (B, arrows) MR FLAIR image reveals signal hyperintensity in T2 images and volume reduction in the hippocampus. (C, D) Neuronal cell loss and concomitant astrogliosis are shown in hippocampus. (E, F) Cytoplasmic localization of ADK immunoreactivity in cells with typical astroglial morphology (arrows), Colocalization of GFAP and ADK are shown in inset. Scale bars = (C, E) 100μm; (D, F) 50μm. SWS, is regarded as a congenital neurocutaneous disorder with disrupting capillary venous vessels in the leptomeninges of the brain and choroid . A port-wine stain ipsilateral to the vascular malformation is often observed in the face of the patient with SWS (Figure 4A) . The recurrent seizures and the epilepsy associated comorbidities such as cognition deficits are the main clinical presentation [54,55]. The epilepsy is often pharmacoresistant when the seizures onset appears at younger age in patients with SWS . Neuroimaging hallmark is that Gadolinium-enhanced MRI and CT scan typically shows leptomeningeal enhancement in all cases (Figure 4B-4D) . Leptomeningeal angiomatosis, neuronal loss and astrogliosis is often observed in neuropathological study . (A) Port wine stain is shown in distribution of trigeminal nerve presented in the patient (arrows). (B-D) Gadoliniumenhanced T1-weighted image of MR showed enhancing leptomeningeal vessels in left hemisphere. (E-F) GFAP-positive reactive astrocytes were demonstrated in cortical gray matter (E, arrows) and white matter (F, arrows) within the lesion area. (G-H) Cytoplasmic localization of ADK immunoreactivity is shown in cells with typical astroglial morphology (G, arrowheads in inset) in cortical gray matter and white matter (H, arrows), and a subpopulation of the remnant of neurons (G, arrows in inset) in cortical gray matter within the lesion. (I-L) Co-localization of ADK (J, red) with GFAP (I, green) and DABI (K, green) confirms expression of ADK, with a predominant cytoplasmic expression, in astroglial cells (L, arrows). The cell with negative GFAP, positive DAPI and positive ADK could be the ADK positive neuron (L, arrowheads). Scale bars = (E-H) 50μm; (I-L) 12.5μm. On the one hand, the main clinical presentation is the recurrent seizures and cognition decline, On the other hand, dysfunction of adenosine system plays an important role in the ictogenesis and epileptogenesis as well as its comorbidities [23,30]. Our recent study demonstrated that overexpression of ADK is involved in the pathogenesis of SWS. ADK expression increased in reactive astrocytes (Figure 4G and Figure 4H) (Figures 4I-4L)  concomitant with astrogliosis within the lesions in SWS. 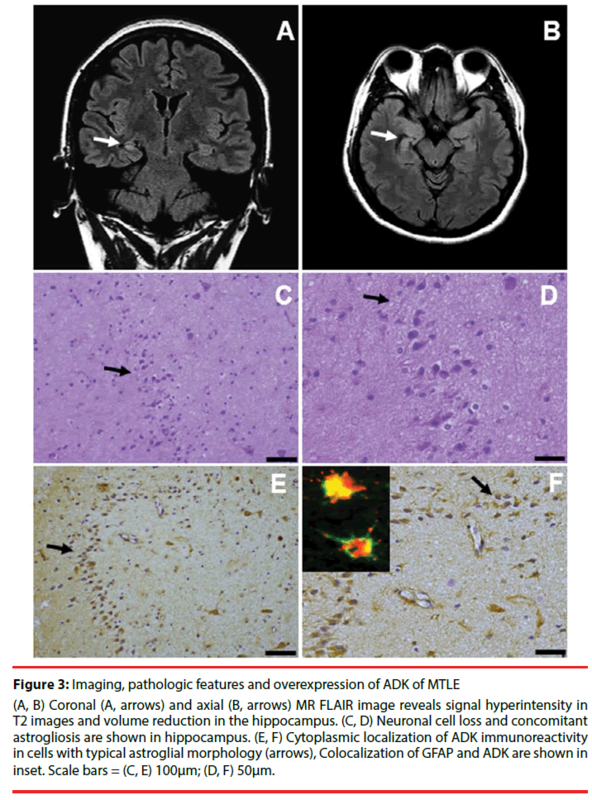 In addition, a subpopulation of neuronal cells in the lesion area showed marked expression of ADK with a predominant cytoplasmic localization (Figure 4G). Overexpression of ADK in SWS, with a predominant cytoplasmic localization, leads to adenosine deficiency in the focus of the lesion and developed to be the epileptogenic zone. From the previous data we can conclude that overexpression of ADK is a solid biomarker for epileptic seizures and development of chronic epilepsy [9-11,15,20-22]. ADK, the main adenosine removing enzyme, linked the connection of reactive astrogliosis and neuronal dysfunction of epilepsy [9,15,57-59]. Focal ADK-related seizures might be the substrate for subsequent seizure generalization and seizures spreading, and might be the beginning of the formation of epileptogenic zone . Overexpression in astrocytic ADK in reactive astrogliosis has be regarded to downregulate the adenosine level in the brain, which lower the seizures threshold and cause recurrent chronic seizures [9,15,19-21]. However, little is known about the functional implication of neuronal ADK in human brain. ADK-tg mice, with overexpression of transgenic ADK throughout the brain, with particularly high levels in hippocampal pyramidal neurons had been demonstrated to be sufficient to downregulate of the tissue concentration of adenosine , and consequent subclinical seizures, contributing mechanism for seizures generation in epilepsy [9,11,16]. Therefore, overexpression of the major adenosine removing enzyme ADK in reactive astrocytes and subpopulation of remaining neurons plays an crucial role in the epileptogensis of neurodegenerative diseases such as MTLE, RE, FCD and SWS . Currently, more and more experimental and clinical research demonstrated the bidirectional relation between epilepsy and associated comorbidities [61-63]. Patients with epilepsy, especially with disabling epilepsy, clinically demonstrate not only recurrent seizures, cognition deficits and psychiatric symptoms such as depression and psychosis. Therefore, there might be common underlying mechanisms between epilepsy and comorbidities associated with epilepsy. The comorbidities and structural brain alterations such as FCD, MTLE and tuber sclerosis are regarded as the predictor for the onset of seizures; and of importance, comorbidities usually suggested the efficacy of the current treatment for epilepsy with antiepileptic drugs, epilepsy resection are intractable [64,65]. Recurrent disabling seizures usually lead to the reorganization of neural circuits and activities in the brain, and subsequent clinical comorbidity syndrome such as cognition deficits, depression and psychosis [6,66]. As a critical upstream regulator of complex homeostatic and metabolic networks, ADK has been demonstrated to play a crucial role in the regulation of cognition process. ADK-tg mice, with transgenic overexpression of ADK in the brain, demonstrated a series of cognition deficits [60,67]. ADK overexpression has been proved to lead to functional concomitant alterations in dopaminergic and glutamatergic functions. Thereby, Adk-tg mice displayed severe cognition deficits including reference memory, working memory, and associative learning . In addition, brain inflammation has been proven as the underlying mechanism of several neuropsychiatric conditions. The recurrent epileptic seizures lead to the inflammation in the brain, may contribute to the neuropsychiatric dysfunction [32,69]. Furthermore, through action on the adenosine receptors, extracellular adenosine has potent anti-inflammatory functions . ADK dysfunction is involved in several pathologies, including epilepsy, epilepsy associated cognition deficits and inflammation. For example, RE is the progressive inflammatory disorder with pharmacoresistant focal epilepsy and EPC and cognition deficits . In fact, in recent years, novel treatment strategies have already been developed that make use of the intracerebral transplantation of rodent and human cells that are ADK deficient and, thus, release adenosine, which demonstrated antiepileptic and neuroprotective properties . Targeting on downregulation of the molecular biomarker ADK may provide the ideal treatment with the benefits of anti-inflammation, antiepilepsy as well as cognitive neuroprotectiion [19,20]. ADK provides important upstream regulation of adenosine-based homeostatic function of the brain and that this mechanism is necessary and permissive to synaptic actions of adenosine acting on multiple pathways. Overexpression of ADK, both neuronal and astroglial, plays an important role in the epileptogenesis and comorbidities associated with epilepsy in human chronic epilepsy such as RE, FCD, MTLE and SWS. ADK-regulating strategies thus represent innovative therapeutic opportunities to reconstruct network homeostasis in these multiple clinical conditions. The therapeutic strategy of adenosine augmentation should be considered and explored deeply, which may greatly improve the prognosis of FCD, MTLE or SWS patients with contraindication for surgical resection. In addition, dysregulation of ADK is a ubiquitous pathologic marker for epilepsy. Therefore, ADK is also regarded as a diagnostic biomarker for epilepsy. In the future, development of a PET tracer for ADK in humans may provide new frontier tools towards evaluation for the development of epilepsy or to measure the effectiveness of therapeutic interventions. The authors thank Professor Detlev Boison (RS Dow Neurobiology Laboratories, Legacy Research Institute, Portland, OR) for his kind and generous gift of ADK antibody. This Project was supported by the Grant from the BIBDPXM2013_ 014226_07_000084, National Natural Science Foundation of China (81571275). Vos T, Bell B, Bolliger I, et al. Global, regional, and national incidence, prevalence, and years lived with disability for 301 acute and chronic diseases and injuries in 188 countries, 1990-2013: a systematic analysis for the Global Burden of Disease Study 2013. Lancet 386(9995), 743-800 (2015). Kwan P, Brodie MJ. Early identification of refractory epilepsy. N. Engl. J. Med 342(1), 314-319 (2000). Sillanpaa M, Schmidt D. Natural history of treated childhood-onset epilepsy: prospective, long-term population-based study. Brain 129(3), 617-624 (2006). Salpekar JA, Berl MM, Havens K, et al. Psychiatric symptoms in children prior to epilepsy surgery differ according to suspected seizure focus. Epilepsia 54(6), 1074-1082 (2013). Salpekar JA, Mishra G, Hauptman AJ. Key issues in addressing the comorbidity of depression and pediatric epilepsy. Epilepsy. Behav 46(1), 12-18 (2015). Witt JA, Helmstaedter C. Cognition in epilepsy: current clinical issues of interest. Curr. Opin. Neurol 30(2), 174-179 (2017). Ravizza T, Onat FY, Brooks-Kayal AR, et al. WONOEP appraisal: Biomarkers of epilepsy-associated comorbidities. Epilepsia 58(3), 331-342 (2017). Josephson CB, Jette N. Psychiatric comorbidities in epilepsy. Int. Rev. Psychiatry 29(5), 409-424 (2017). Li T, Steinbeck JA, Lusardi T, et al. Suppression of kindling epileptogenesis by adenosine releasing stem cell-derived brain implants. Brain 130(5), 1276-1288 (2007). Masino SA, Li T, Theofilas P, et al. A ketogenic diet suppresses seizures in mice through adenosine A(1) receptors. J. Clin. Invest 121(7), 2679-2683 (2011). During MJ, Spencer DD. Adenosine: A potential mediator of seizure arrest and postictal refractoriness. Ann. Neurol 32(5), 618-624 (1992). Boison D, Aronica E. Comorbidities in Neurology: Is adenosine the common link? Neuropharmacology 97(1), 18-34 (2015). Gao Q, Luan G. Mechanisms of Vagus Nerve Stimulation for Epilepsy and Associated Comorbidities. Neuropsychiatry (London) 7(7), 16-21 (2017). Li T, Lan JQ, Boison D. Uncoupling of astrogliosis from epileptogenesis in adenosine kinase (ADK) transgenic mice. Neuron. Glia. Biol 4(2), 91-99 (2008). Aronica E, Zurolo E, Iyer A, et al. Upregulation of adenosine kinase in astrocytes in experimental and human temporal lobe epilepsy. Epilepsia 52(9), 1645-1655 (2011). Anink J, Iyer A, Zurolo E, et al. Overexpression of ADK in human astrocytic tumors and peritumoral tissue is related to tumor-associated epilepsy. Epilepsia 53(1), 58-66 (2012). Luan G, Wang X, Gao Q, et al. Upregulation of Neuronal Adenosine A1 Receptor in Upregulation of Neuronal Adenosine A1 Receptor in Human Rasmussen Encephalitis. J. Neuropathol. Exp. Neurol (76)8, 720-731 (2017). Luan G, Xiong F, Chen F, et al. Overexpression of adenosine kinase in patients with epilepsy associated with Sturge-Weber syndrome. Neuropsychiatry (London) 7(7), 640-652 (2017). Boison D. Adenosine dysfunction in epilepsy. Glia 60(8), 1234-1243 (2012). Studer FE, Fedele DE, Marowsky A, et al. Shift of adenosine kinase expression from neurons to astrocytes during postnatal development suggests dual functionality of the enzyme. Neuroscience 142(1), 125-137 (2006). Aronica E, Sandau US, Iyer A, et al. Glial adenosine kinase--a neuropathological marker of the epileptic brain. Neurochem. Int 63(7), 688-695 (2013). Kiese K, Jablonski J, Boison D, et al. Dynamic Regulation of the Adenosine Kinase Gene during Early Postnatal Brain Development and Maturation. Front. Mol. Neurosci 9, 99 (2016). Rasmussen T, Olszewski J, Lloydsmith D. Focal seizures due to chronic localized encephalitis. Neurology 8(6), 435-445 (1958). Bien CG, Granata T, Antozzi C, et al. Pathogenesis, diagnosis and treatment of Rasmussen encephalitis: a European consensus statement. Brain 128(3), 454-471 (2005). Li T, Gao Q, Luan G. Adenosine dysfunction in Rasmussen's encephalitis. Neuropsychiatry (London) 6(5), 280-285 (2016). Li T, Gao Q, Luan G. Rasmussen's Encephalitis Clinical Features and Mechanism Adavances. J. Autism. Epilepsy 1(2), 1007 (2016). Li T, Gao Q, Luan G. HMGB1-TLR Signaling in Rasmussens Encephalitis. J. Neuroinfect. Dis 7, 223 (2016). Bien CG, Urbach H, Deckert M, et al. Diagnosis and staging of Rasmussen's encephalitis by serial MRI and histopathology. Neurology 58(2), 250-257 (2002). Rogers SW, Andrews PI, Gahring LC, et al. Autoantibodies to glutamate receptor GluR3 in Rasmussen's encephalitis. Science 265(5172), 648-651 (1994). Farrell MA, Droogan O, Secor DL, et al. Chronic encephalitis associated with epilepsy: immunohistochemical and ultrastructural studies. Acta. Neuropathol 89(4), 313-321 (1995). Lovatt D, Xu Q, Liu W, et al. Neuronal adenosine release, and not astrocytic ATP release, mediates feedback inhibition of excitatory activity. Proc. Natl. Acad. Sci 109(1), 6265-6270 (2012). Fauser S, Huppertz HJ, Bast T, et al. Clinical characteristics in focal cortical dysplasia: a retrospective evaluation in a series of 120 patients. Brain 129(7), 1907-1916 (2006). Aronica E, Becker AJ, Spreafico R. Malformations of cortical development. Brain. Pathol 22(3), 380-401 (2012). Palmini A, Najm I, Avanzini G, et al. Terminology and classification of the cortical dysplasias. Neurology 62(3), S2-S8 (2004). Spreafico R, Blumcke I. Focal Cortical Dysplasias: clinical implication of neuropathological classification systems. Acta. Neuropathol 120(3), 359-367 (2010). Blumcke I, Thom M, Aronica E, et al. The clinicopathologic spectrum of focal cortical dysplasias: a consensus classification proposed by an ad hoc Task Force of the ILAE Diagnostic Methods Commission. Epilepsia 52(1), 158-174 (2011). Muhlebner A, Coras R, Kobow K, et al. Neuropathologic measurements in focal cortical dysplasias: validation of the ILAE 2011 classification system and diagnostic implications for MRI. Acta. Neuropathol 123(2), 259-272 (2012). Ying Z, Gonzalez-Martinez J, Tilelli C, et al. Expression of neural stem cell surface marker CD133 in balloon cells of human focal cortical dysplasia. Epilepsia 46(11), 1716-1723 (2005). Barkovich AJ, Guerrini R, Kuzniecky RI, et al. A developmental and genetic classification for malformations of cortical development: update 2012. Brain 135(5), 1348-1369 (2012). Hadjivassiliou G, Martinian L, Squier W, et al. The application of cortical layer markers in the evaluation of cortical dysplasias in epilepsy. Acta. Neuropathol 120(4), 517-528 (2010). Orlova KA, Tsai V, Baybis M, et al. Early progenitor cell marker expression distinguishes type II from type I focal cortical dysplasias. J. Neuropathol. Exp. Neurol 69(8), 850-863 (2010). Crino PB. mTOR: A pathogenic signaling pathway in developmental brain malformations. Trends. Mol. Med 17(12), 734-742 (2011). Iffland PN, Crino PB. Focal Cortical Dysplasia: Gene Mutations, Cell Signaling, and Therapeutic Implications. Annu. Rev. Pathol 24(12), 547-571 (2017). Engel JJ. Introduction to temporal lobe epilepsy. Epilepsy. Res 26(1), 141-150 (1996). Berkovic SF, Andermann F, Olivier A, et al. Hippocampal sclerosis in temporal lobe epilepsy demonstrated by magnetic resonance imaging. Ann. Neurol 29(2), 175-182 (1991). Blumcke I, Thom M, Aronica E, et al. International consensus classification of hippocampal sclerosis in temporal lobe epilepsy: A Task Force report from the ILAE Commission on Diagnostic Methods. Epilepsia 54(7), 1315-1329 (2013). Shirley MD, Tang H, Gallione CJ, et al. Sturge-Weber syndrome and port-wine stains caused by somatic mutation in GNAQ. N. Engl. J. Med 368(21), 1971-1979 (2013). Manta S, Dong J, Debonnel G, et al. Enhancement of the function of rat serotonin and norepinephrine neurons by sustained vagus nerve stimulation. J. Psychiatry. Neurosci 34(4), 272-280 (2009). Comi A. Current Therapeutic Options in Sturge-Weber Syndrome. Semin. Pediatr. Neurol 22(4), 295-301 (2015). Li T. Epilepsy and Associated Comorbidities. Neuropsychiatry (London) 1(1), 1-3 (2017). Simonati A, Colamaria V, Bricolo A, et al. Microgyria associated with Sturge-Weber angiomatosis. Child. Nerv. Syst 10(6), 392-395 (1994). Li T, Quan LJ, Fredholm BB, et al. Adenosine dysfunction in astrogliosis: cause for seizure generation? Neuron. Glia. Biol 3(4), 353-366 (2007). Gouder N, Scheurer L, Fritschy JM, et al. Overexpression of adenosine kinase in epileptic hippocampus contributes to epileptogenesis. J. Neurosci 24(3), 692-701 (2004). Fedele DE, Gouder N, Guttinger M, et al. Astrogliosis in epilepsy leads to overexpression of adenosine kinase, resulting in seizure aggravation. Brain 128(10), 2383-2395 (2005). Shen HY, Lusardi TA, Williams-Karnesky RL, et al. Adenosine kinase determines the degree of brain injury after ischemic stroke in mice. J. Cereb. Blood. Flow. Metab 31(7), 1648-1659 (2011). Kumar U, Medel-Matus JS, Redwine HM, et al. Effects of selective serotonin and norepinephrine reuptake inhibitors on depressive- and impulsive-like behaviors and on monoamine transmission in experimental temporal lobe epilepsy. Epilepsia 57(3), 506-515 (2016). Wilson SJ, Baxendale S. Reprint of: The new approach to classification: Rethinking cognition and behavior in epilepsy. Epilepsy. Behav 64(1), 300-303 (2016). Rao G, Mashkouri S, Aum D, et al. Contemplating stem cell therapy for epilepsy-induced neuropsychiatric symptoms. Neuropsychiatr. Dis. Treat 13(1), 585-596 (2017). Hermann BP, Jones JE, Jackson DC, et al. Starting at the beginning: the neuropsychological status of children with new-onset epilepsies. Epileptic. Disord 14(1), 12-21 (2012). Hermann BP, Dabbs K, Becker T, et al. Brain development in children with new onset epilepsy: a prospective controlled cohort investigation. Epilepsia 51(10), 2038-2046 (2010). Kanner AM. Can neurobiological pathogenic mechanisms of depression facilitate the development of seizure disorders? Lancet. Neurol 11(12), 1093-1102 (2012). Singer P, Boison D, Shen HY, et al. Working memory and the homeostatic control of brain adenosine by adenosine kinase. Neuroscience 213(1), 81-92 (2012). Yee BK, Singer P, Chen JF, et al. Transgenic overexpression of adenosine kinase in brain leads to multiple learning impairments and altered sensitivity to psychomimetic drugs. Eur. J. Neurosci 26(11), 3237-3252 (2007). Vezzani A, Aronica E, Mazarati A, et al. Epilepsy and brain inflammation. Exp. Neurol 244(1), 11-21 (2013). Blackburn MR, Vance CO, Morschl E, et al. Adenosine receptors and inflammation. Handb. Exp. Pharmacol 193(1), 215-269 (2009). Boison D. Adenosine augmentation therapies (AATs) for epilepsy: prospect of cell and gene therapies. Epilepsy. Res 85(1), 131-141(2009).